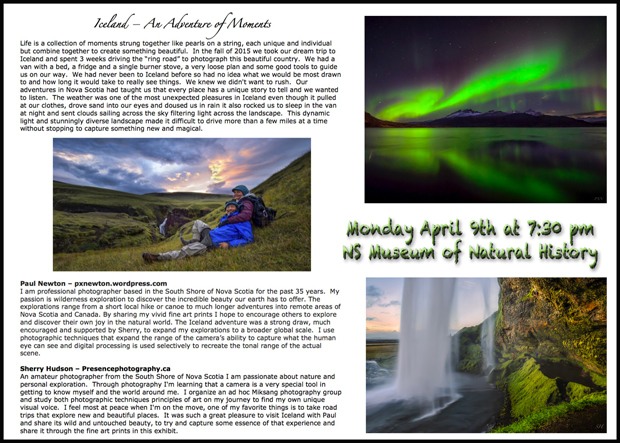 Join Paul Newton and Sherry Hudson as they share their photographic journey to Iceland in the fall of 2015. Three years in the dreaming, this journey will take you on a circumnavigation of the world’s most active volcanic island. You will visit steaming sulphurous hot springs, endless lava fields covered in verdant moss, vast glaciers aglow in the Northern Lights, mist shrouded mountains, black volcanic sand beaches and waterfalls of every imaginable size. Discover how the rich and dynamic environment taught Sherry and Paul to accept the gifts Iceland had to offer one moment at a time. A 90-minute tale of 4000 kilometers, in 21 days, 8000 pictures and 1 flat tire. This entry was posted in 2018, Seminars on April 7, 2018 by Darryl Robertson.